Lock in a great price for Swan Cruises Halong – rated 8.5 by recent guests! Lots of delicious fresh food to try during the tour...a great compliment to the wonderful scenery arou d the bay. We enjoyed the kayaking and chance to explore the cave. Our tour guide, Luna was excellent. Very happy, energetic and informative. Would definitely recommend a tour with her group. Comfortable cabin and boat for two night cruise. Food was spectacular and each meal involved several courses. Our tour guide Linda was great. Overall really enjoyed our time over the course of 3 days - glad we did two nights instead of just one. The boat was nice and staff was amazing! They give you a ton of food! Expect a lot of seafood but a decent variety of dishes. Eliz, our host, was a total sweetheart and very knowledgeable? The staff was extremely accommodating and made our Ha Long bay cruise a great experience. We went in the off-season so the weather wasn't fantastic but still had a great time. Boat was clean, food was good, and activities were well planned and fun. Very friendly and helpful staff. The boat was smaller so that means less people and your needs are more catered too. 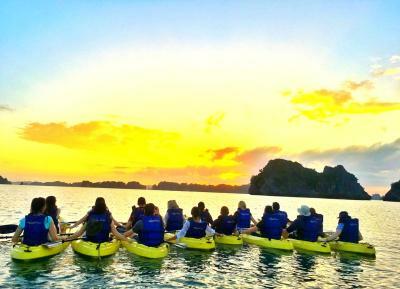 however, I wish we had more time to kayak and explore more of Ha Long Bay during the cruise. Overall great cruise..originally had a room with a balcony but got down graded because of boat work. They only refunded me 10$. I’m pretty sure if It was the other way around and upgraded to a balcony room it would be more then 10$. Nothing I could do at that point though. Staff was great! Transport bus from Hanoi has tiny seats but it’s a country filled with tiny people. Great cruise and experience! Def recommend. The overall trip was great! Huy was our tour guide and was personable, funny, and gave us good direction on both on and off the boat. The food was tasty and the drinks kept flowing (you pay extra for alcohol). The scenery was breathtaking and the cave and kayak excursions were a lot of fun! OUr guide, Handsome, was great. He worked hard, was very sociable and nice to everybody. He spent time with the guests and he was very helpful. The rest of the staff also did a very good job. Swan Cruises Halong This rating is a reflection of how the property compares to the industry standard when it comes to price, facilities and services available. It's based on a self-evaluation by the property. Use this rating to help choose your stay! One of our top picks in Ha Long.Swan Cruises Halong is a traditional wooden vessel with helpful staff. Located in Ha Long, it is 1.4 mi from Ha Long Night Market. The cruise itinerary includes the more pristine Bai Tu Long Bay, which is less touristy. The air-conditioned rooms offer bay views and feature wooden flooring and a wardrobe. Private bathroom comes with a shower and hairdryer. Bed linen is available. Guests can enjoy a meal at the on-site restaurant, followed by a drink at the bar. The property also offers special diet menus. Guests can engage in activities such as kayaking, sunset tea and cooking demonstrations. Cat Bi International Airport is 24 mi away. When would you like to stay at Swan Cruises Halong? Located on the second deck, this suite features a private balcony and panoramic window. Airfares, shuttle bus Hanoi- Halong- Hanoi (pick up in the Old quarter of Hanoi center with USD 25 per person), and car transfer, beverages, tips and personal expenses. All other services not clearly mentioned above. The deluxe double or twin room has an ocean view with oriental motif to create a harmonious space between cozy traditional style and modern comforts. With an inter-connecting door that allows ease of access and privacy, this room includes 1 triple room and 1 double or twin room. This family room features ocean view. Airfares, shuttle bus Hanoi- Halong- Hanoi (pick up in the Old quarter of Hanoi center with USD 25 person), and car transfer, beverages, tips and personal expenses. All other services not clearly mentioned above. This family triple room features ocean view. 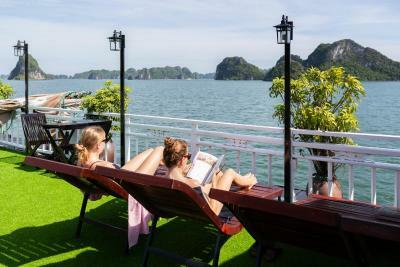 House Rules Swan Cruises Halong takes special requests – add in the next step! Swan Cruises Halong accepts these cards and reserves the right to temporarily hold an amount prior to arrival. Cruise itinerary and schedule are subject to change due to weather, tide levels and operating conditions. Swimming, kayaking may be canceled due to poor weather. Unused services are not subject to a refund. Meals onboard include: Vietnamese, seafood and international. Guests should advise any special food preferences, allergies or dietary requirements at least one (1) week prior to the cruise date. Advance registration is required 03 days before arrival with full name, date of birth, nationality, gender, passport number and visa expiry date for all passengers. Rates are not inclusive of transportation from Hanoi to Ha Long and from Ha Long back to Hanoi. 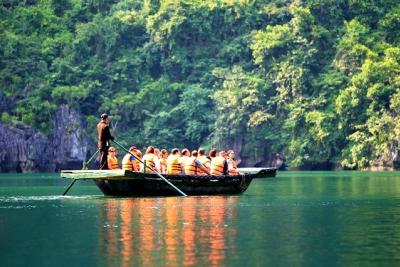 Round-trip transfer by shuttle bus from Hanoi center to Halong City is provided with a surcharge. Please contact the cruise office directly for more details about transportation price, time and pick-up point. For car pick-up service, guests must provide address for pick-up at least 1 day before departure. Halong City is approximately 106 mi or a 3-4 hour drive from Hanoi. Swan Boutique Cruises can assist with transfers from your hotel or from Noi Bai International Airport in Hanoi. Please inform Swan Cruises Halong of your expected arrival time in advance. You can use the Special Requests box when booking, or contact the property directly using the contact details in your confirmation. Excellent tour, Eliz is a fantastic guide, and the location is dreamland! I paid 313 USD for 2 people for a 1 night stay and got a little room in the lower deck and the itinerary felt hectic as the tour guide kept us occupied all the time with no time left for you to get lost in the beauty of the bay!! Sometimes it felt like a military drill and she was not warm towards Indians. The staff were excellent, the rooms were great, the food was amazing, catered for our food allergies with no fuss at all. A perfect, value for money trip for our family. Such a fab cruise! Daisy was an awesome tour guide. The deluxe double room is a decent size. We only did the one night cruise and I would say this is enough! We got four HUGE meals on board so you definitely won’t be hungry. If you don’t like seafood make sure you let them know as we got served a lot of seafood - which is awesome in my opinion. Highly recommend. Nothing bad to say, we were expecting drink prices onboard to be skyrocketed but they are reasonably priced for westerners, they even threw in a happy hour 3 for 2 deal to get the night started. Whole cruise was good value for money, we had a great time. Recommend 10/10. Some dirt and dust in the room and bathroom. Shower fixing coming away from the wall. Overall a bit tired looking. The pictures of the cabin on the website did not reflect the size or condition of the cabin that we stayed in. Brilliant tour guides, and a great tour route through Bai Tu Long bay, mostly away from crowds, particularly on the second day (of 3). Fantastic location. 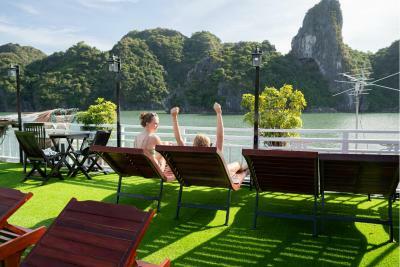 This is the perfect Ha Long Bay cruise. A small enough boat that you are a name rather than a number. The food was delicious and just kept coming! I would highly recommend this tour to anyone one planning on visiting. I really enjoyed my trip Bai Tu Long Bay with Swan Cruise. Client service was good. I missed the transfer to the bay, and they solved it quickly and easy. Our guide Jenny (from the block) was the best. She is nice, funny, knew a lot and told us about the Vietnamese culture. She was also was very attentive with our names and different diets which made our stay pleasant. Not to mention the experience on the boat. We were only with 20 people which was the right amount to get to know other travellers. Crew was nice, lots of delicious local dishes, and awwwww the view was stunning. Thank you Jenny and Swan Cruise!! It would be nice to not have to switch boats on our only full day. We stayed 2 nights and they had to drop off people who were staying only 1 night back to the harbor. It would be nice if everyone on our boat stayed 2 nights and if we had the same tour guide the whole time. The rooms were much more modern than I expected, and drinks were priced the same as they are in Hanoi. I also loved the excursions and activities planned. I am surprised Swan does not advertise them more!